A beautiful kitchen, a spacious master bedroom, a comfortable great room and a garage with an interior entrance to the home. Chances are, these are just some of the things you’re looking for in a brand-new home in Calgary. The Brentwood home design offers all of those features along with many more. Take a few moments to find out what else the Brentwood has to offer you and your family. 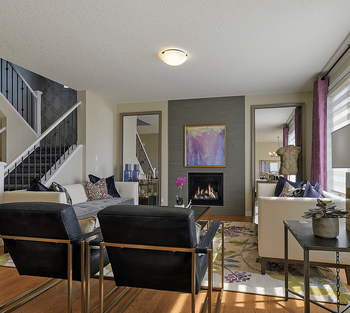 The 9-foot ceiling is the first thing you’ll notice when you walk through the front door of the Brentwood. The built-in bench in the airy foyer is a convenient place to lay down your bag, briefcase or jacket at the end of a long day at work or school. A kitchen is a popular place for a family to gather and talk over the events of the day. The inviting design of the Brentwood’s kitchen features an island with an eating bar where family members can sit and talk while a meal is being prepared. Expansive counterspace along with a stainless-steel refrigerator, dishwasher, microwave and other modern appliances make this kitchen both practical and attractive. A stylish half-bathroom nearby makes it easy for family members to wash up for dinner. Would you like a separate area where you can store flour, sugar, pasta, canned goods and other cooking related items on sturdy shelves? If so, you’ll be pleased with the pantry just off the kitchen in the Brentwood. Organize your dry goods, extra utensils, pet food and more in a way that makes any item easy to find! The open design of the main floor has many highlights. One of those highlights is its great room. Set up your entertainment centre and watch movies or play board games with the family on Saturday nights. No matter the activity, the soft, natural light pouring into this comfortable room makes it the perfect place to gather. Would your family enjoy eating Thanksgiving dinner together in a lovely dining room? The dining room in the Brentwood can be transformed for a formal holiday meal or take on a casual feel for family dinners throughout the week. This versatile space is suitable for a gathering of any sort. A flex room on the main floor of the Brentwood serves whatever purpose you have for it. You may like the idea of having an office near the kitchen so you can grab a snack whenever you want one. Have you always liked the idea of having a mudroom in your home? If the answer is yes, the Brentwood has what you’re looking for. After stepping through the door from the garage, family members can sit on the bench and slip off their dirty or snowy shoes as well as hang up their wet coats in order to keep the mess where it belongs. Family members can move from the mudroom through the pantry and into the kitchen for a fast snack. The tremendous amount of space in the master bedroom makes it a wonderful canvas for any type of décor. Put a large bed in the room along with a dresser, loveseat, easy chair or any other furniture you like to have around for relaxation time. Paint the walls in a pastel colour to enhance the soothing, calm atmosphere in this bedroom. 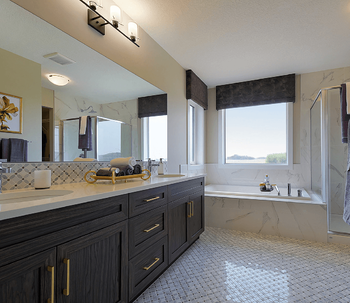 A double sink with lots of surrounding counter space gives you and your partner lots of room for makeup, perfumes, shaving items and more as you get ready in the morning. The bathtub is made for relaxing and letting the cares of the day float away. The walk-in closet in the master bedroom helps to organize and display clothing for all seasons. Use the abundance of space to hang up your pants, blouses, blazers, scarves and more to keep them wrinkle-free. The built-in shelves are great for shoes, jewellery, belts, boxes and other items that need to be kept in order. Two more spacious bedrooms occupy the upper floor of the Brentwood. Do you need a room for a new baby, a grade schooler, or a returning college student? Perhaps you’d like a guest room upstairs where visiting friends can stay. Each of these rooms is pleasant and full of natural light. A stylish bathroom featuring a double sink is just down the hall, convenient to both rooms. 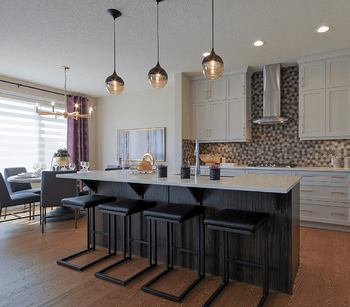 The Brentwood has all of the features, amenities and extra special touches to make life in Calgary comfortable for today’s busy, modern family. Get in touch with us today to learn more about this model and your building options.